Crowdsource: a tactic businesses can use to find out what kinds of products or services their customers wish they’d offer. It can save a business time and money because it helps make clear what customers want. In this case study, we’ll show you how Tusker Trail used Facebook and Tusker Trail’s website to determine their next Tusker Trail Trek destination. We’ve laid out the steps they took to plan and execute a crowdsourcing Campaign that resulted in 16,174 Campaign views and 4,622 votes. Why Tusker Trail decided to let their existing customers determine the location of their next trek. How they determined which online outlet to use to promote their Campaign. How they motivated their followers to vote. How Tusker Trail continued communicating with their entrants once the Campaign had ended. Here’s a step-by-look at what Tusker Trail did to accomplish their goals plus tips for how you can apply these tips to your own Campaigns. Setting defined goals is key to running a successful Campaign. Decide: What are the top one or two things (three at the most) you want to achieve? 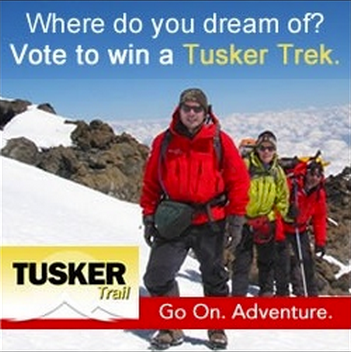 Tusker Trail’s primary goal was to generate email addresses to be used for future marketing efforts. Their secondary goals were to increase the exposure of the Tusker Trail brand to a relevant audience, and to position the company on social media as an innovative leader in the adventure travel category. Tusker Trail decided to build a crowdsourcing contest to meet their goals because it allowed them to interact with their followers and collect email addresses. 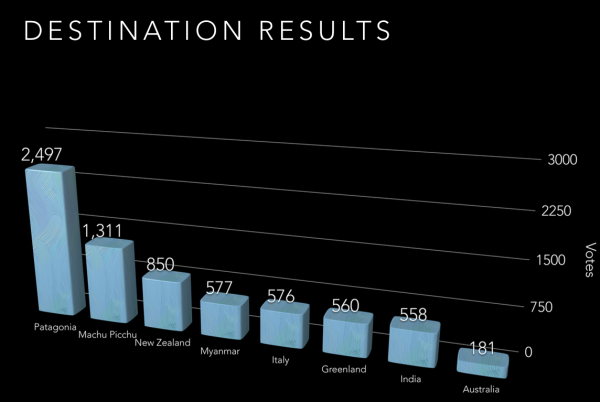 There was also a valuable prize: a trek to one of four destinations. The takeaway: Keeping your customers and fans in mind when creating goals will ensure you’re running a meaningful and relevant promotion. Once you’ve narrowed down your goals, it’s time to determine where you should host your promotion in order for the widest audience possible to see it. Social networks and software companies have opened the door for a variety of opportunities for placing a campaign. Businesses have the option of hosting a promotion in a single place, such as an individual social network or their website, or they can combine these two strategies. When Tusker Trail considered the best place to host their promotion, they determined that the more places they could place the promotion the wider an audience they could reach. Using ShortStack’s publishing features Tusker Trail was able to place their Campaign on their Facebook Page and embed it on their website, essentially doubling the reach of the Campaign. The takeaway: Make it easy for visitors to find and enter your promotion from multiple channels. The most important step in executing a Campaign is promoting it. The “build it and they will come” theory does not work for most marketing campaigns. Tusker Trail drove all of their Facebook-generated traffic to their Facebook app. This included organic reach from status updates and a small investment in sponsored posts and Facebook ads. It’s smart to only send Facebook fans and users to the Facebook hosted Campaign so that entrants are not limited by whether or not they have a Facebook profile. All other online followers should be directed to a website or landing page to ensure a user-friendly experience. To drive traffic to Campaign Tusker Trail embedded on their website, Tusker Trail purchased banner and display ads using a Google AdWords campaign. These ads led visitors to the homepage of their website where they could access the Campaign. To further their promotions and ensure they reached their entire online audience, Tusker Trail posted about their promotion on their blog, sent an email newsletter to past customers in their email database and posted on Twitter and Google+, directing users on those platforms to Tusker.com. Finally, Tusker Trail implemented a public relations strategy that included reaching out to industry and local media. The takeaway: Have a well-rounded promotion strategy that places your campaign in front of as many people as possible. Analyzing the results of a crowdsourced Campaign are a crucial step in the process. Results determine whether goals were met and help shape a follow-up marketing strategy. 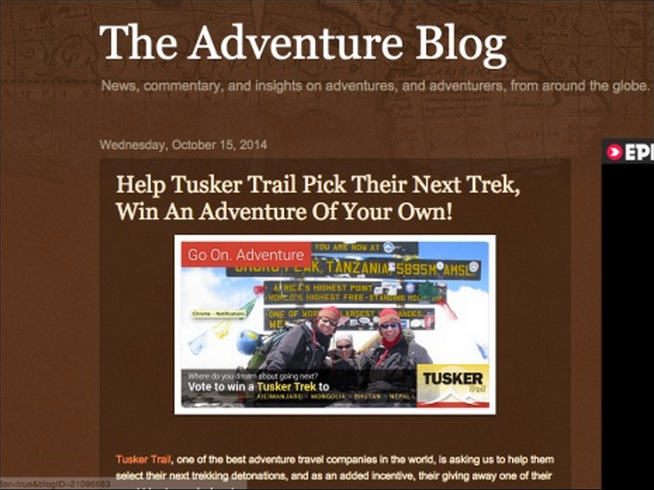 Tusker Trail received 16,174 views to their Campaign, and 4,622 votes. Tusker Trail collected 1,817 new email addresses and, although they weren’t requiring Likes, the contest also resulted in 353 new Facebook fans. 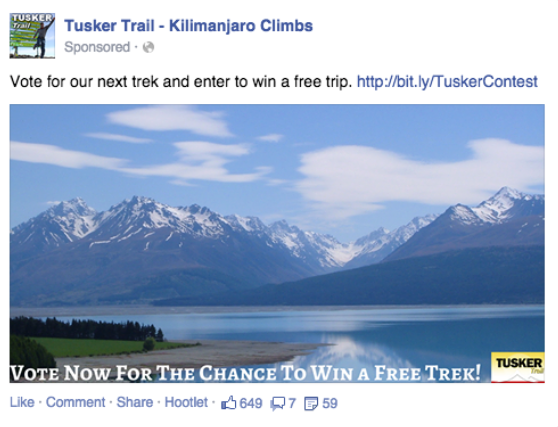 From September 12 through October 31, 2014, Tusker Trail ran Facebook ad campaigns and were able to garner 298,255 impressions and 12,848 clicks at $0.26 per click. When it comes to promoting a campaign, traditional efforts are still valuable. Tusker Trail’s local PR efforts landed them stories in a variety of travel outlets including About.com, Adventure Travel News and The Adventure Travel. These placements allowed their promotion to be tweeted out to an audience well beyond their existing followers. Ultimately Tusker Trail’s audience voted (in a landslide) for the company to add Patagonia to its lineup. The takeaway: A thorough analysis of results can assist in adjusting your strategy for your next promotion. Once a promotion is over there is still more work to do. A significant part of a promotion’s success is using the information and data collected for future marketing efforts. Tusker Trail prepared a specific follow-up email strategy to target the 1,817 entrants they had on their promotion. They set up a newsletter series that included five emails which were sent out over a period of several months after the promotion ended. The emails included travel tips, guides and information about new treks. Once the series ended the 1,817 people were added to Tusker Trail’s regular email schedule. The takeaway: Have a follow-up marketing strategy in place to continue communicating with entrants and converting them into sales.